"We have been with Hall Media Solutions (formerly Barry Bruce & Co.) for many years. It has been our pleasure working with them since their business has started. Having folks that help with the buying decisions, usually expensive one's, that have to do with marketing your business can make life easier. They have the experience, buying power, and the trust of our community. We look forward to our future and Hall Media Solutions being part of it. Thank you and keep up the great work." "There is no one I trust more highly for our marketing and advertising than Dawn Hall and Hall Media Solutions. She gets our audience, our practice philosophy, our market, and our budget; and she always seems to work magic.The Hall Media Solutions office is friendly, experienced, and unequivocally professional. We love to hear when a patient or community leaders mention they've seen our ad. We continue to be impressed and excited not just by our impression numbers, but by our conversion numbers." "The Family Owned Markets have been using Dawn Hall for several years to help with our Marketing programs. 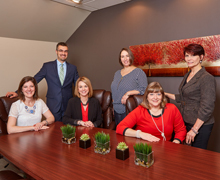 The combined knowledge and experience within their company make them the Top Choice for Marketing expertise in the Central PA market. If you are in need of Media advice, help, buying, or planning, there is nobody better. You will get professionalism at its finest, honesty at its best, and creativity at its peak." "We are always thrilled with the work Hall Media Solutions does for us! We appreciate their commitment to representing us authentically and finding the most effective ways to use our budget. Their wisdom is invaluable as they seek to help us thrive in the marketplace!" "Just wanted to take a moment to let you know what a great job Paul and Dawn are doing for us. I know they are extremely busy, as well, but they always make time for us and deliver!!! In the recent months of us being short-staffed and trying to get our arms around budget/plans/deadlines, their help has made a difference and has helped us immensely!! Many, many thanks to your fabulous team. "Barry and his dedicated staff are always responsive to our needs. Tomlinson Bomberger has benefited greatly, and our business has grown dramatically since our partnership began in 1993. We are very happy to be doing business with Barry Bruce & Company, Inc."
Tomlinson Bomberger Lawn Care, Landscape, and Pest Control, Inc.
"It has been an honor to work with Dawn and the Hall Media Solutions team. I have found them to be professional, experienced and timely. The number one reason I will not use anyone else is that I truly trust Dawn with my business. Since I have entrusted her with our marketing, I have seen exponential growth." "We have had the privilege of working with Hall Media Solutions since 2015. When our relationship began, we were in the process of opening our new location. Dawn's creativity and knowledge helped us maximize our marketing budget and reach. Dawn has a great knowledge of the media and has helped us understand the best opportunities for our business. I highly recommend Dawn and her team!" website design by Hall Media Solutions :: powered by SiteStrux, Inc.